Lawmakers worry that they no longer have a key ally in their quest to scale back tariffs. WASHINGTON — Republicans on Capitol Hill were left scrambling Wednesday after losing a key White House ally in their quest to stop or scale back President Donald Trump's proposed steel and aluminum tariffs. GOP lawmakers had been relying on Gary Cohn, Trump's top economic adviser who announced Tuesday he was resigning, to act as a mediating influence in their bid to limit the scope of the potential trade war Trump is threatening. "Gary Cohn’s departure is not a good signal for where we’re headed," Sen. Tim Scott, R-S.C., who is critical of broad tariffs, said. Cohn's resignation was another clear signal that his arguments against a broad implementation of tariffs were ineffective and that the president is set on moving forward with them. Trump repeated that insistence Tuesday during a news conference with Sweden's prime minister, Stefan Löfven. "So we're doing tariffs on steel. We cannot lose our steel industry. It's a fraction of what it once was," Trump said. "And we can't lose our aluminum industry, also a fraction of what it once was." With Trump's formal announcement expected as early as Thursday, Republicans in Congress said they would miss having a key partner in the White House. “Gary’s as good as they come," Sen. Orrin Hatch, R-Utah, said in a statement to NBC News on Tuesday after Cohn’s resignation. "He was a heavyweight during the tax debate, helping to successfully deliver pro-growth tax reform to the American people. His keen instincts, wisdom and talent will be sorely missed in this administration." 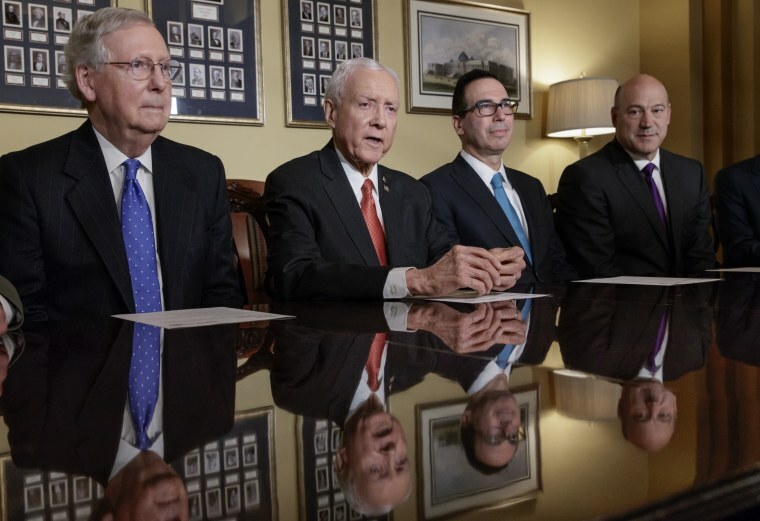 Earlier Tuesday, Hatch, echoing the Republican refrain on tariffs, wrote a letter to the administration saying that Trump should take a more targeted approach as opposed to a blanket 10 percent tax on imported aluminum and 25 percent on all imported steel. Gary Cohn has played an invaluable role as the president’s top economic adviser. I am thankful for his service and know he will succeed in his future endeavors. It's unclear who will fill the void left by Cohn, whose exit leaves Commerce Secretary Wilbur Ross and White House aide Peter Navarro as the main advisers for Trump on trade, and they have been pushing the president to be aggressive. Ross fanned out on cable news early Wednesday morning touting strong trade enforcement even as he emphasized there could be some “flexibility” in the tariffs by potentially exempting Canada and Mexico. Congressional Republicans, however, are also worried about the impact broad tariffs would have on the economy leading into the midterm elections, especially as they hope to ride a wave of support for their tax bill into November. The latest polls show that the Republican tax plan is becoming more popular. For the first time, a majority of respondents in late February said they support the plan. Rep. Kevin Brady, R-Texas, chairman of the House Ways and Means Committee, who co-drafted the tax plan and has oversight on trade, drafted his own petition that has been signed by 107 House Republicans that he sent to Trump. But Sen. Cory Gardner, R-Colo., and head of Senate Republicans' campaign committee, said the GOP message in 2018 should be about a strong economy and tax cuts. But if new tariffs interfere? "The White House will have to explain why their plan doesn’t do that," Gardner said. Trump is finding support, however, among some Democrats up for re-election in 2018 in rust-belt states that supported Trump in the 2016 election. Sens. Joe Manchin of West Virginia and Bob Casey of Pennsylvania have said they back the president’s intention on tariffs. Sen. Sherrod Brown, D-Ohio, said he thinks China needs to be punished more than Canada, but said he urged the White House to impose tariffs. “The president hasn’t been exactly masterful in convincing people, but the aggressiveness to enforce steel is the right place to be,” Brown said. Senate Democratic Leader Chuck Schumer of New York said Cohn's departure is a bigger issue than just trade. "One of the problems here is the White House is getting hollowed out, and the number of people capable of doing things, doing real things, whether you agree or disagree ideologically, is getting smaller and smaller," he said, "and they seem unable to recruit new people to take these jobs."